The Corsage Project is a non-profit organisation with a mission: every girl who wants to go to prom, but can't afford to do so, will be able to in style. BeadFX has been a champion of the Corsage project since 2005. Students are identified through confidential referrals from school guidance counselors, Children’s Aid, youth, or social workers. Girls who are referred are formally invited to attend a ‘Boutique Ball’ in May where, assisted by a personal shopper, they select a gown of their choice, and shoes and accessories to match. With your help, we want to do what we know how to do best - stylish, blingy, fashionable jewelry. Throughout the month of March on select dates, beadFX is hosting Corsage Project Open Beading Nights. Drop by on any of these dates to make jewellery to donate. Stephanie Dixon will be here to cheer you on and assist with design. If you're working on your own at home, take a look at these beautiful pieces from past years for tips and ideas. There are still a few places left for Diane's Fitzgerald's classes - 3 to be exact. Lezlie Winemaker's Murrini Madness is March 12 & 13. It promises to be swell! Have a great rest of week Amigas! I'm back from a week off - I "went dark" - left the computer behind - didn't check my email - stayed off Facebook. Went and immersed myself in my other life - the one with all the dogs in it. Sooooo - what have I got for you this week? uuuuuh. I have some great stories - not necessarily relevant or particularly politically correct. I could talk about aging parents and the responsibility that brings. Or the fear that in seeing them, you are looking into a mirror across time - seeing your own future and wondering how to turn part of it aside. Or the puzzle presented by seeing some much older folks who seem vital and alert and on the ball, and others that has slowly slid into a child-like state. The fear of growing old and feeble and having your memories slip away. I can't even find my *&@$# car keys and I had them 20 minutes ago! I could talk about slowing down and spending some quiet time by yourself. I could talk about the sorrow of losing a beloved four-legged family member. No - wait, I can't talk about that yet - that just hurts too much. D4mn it - I'm struggling for something upbeat here. When all else fails - take solace in the beads. Let's have a sneak peek at what is coming up this week. Size 10 Cut Delica beads. Because you wanted Japanese 10/0 Delicas. Or we wanted them. Same difference. We want what you want. March's Stone of the Month. Dog Tooth Amethyst - Purple and White. Metal Seedbeads. These are cool - They are seedbeads, but instead of glass with a finish to make them look like metal - they really are metal! I'm intrigued by these! Just remember - when Life hands you Lemons - dyslexics make Melon-ade. My Apologies to you all. I apparently failed in posting this last week. I prepped it early as I was going away for Family Weekend and thought I had set it to post. Apparently I failed to make it happen so here is last weeks post. I recently taught an Art Clay Copper Class and it reminded me that it can be a little finicky to manage and there are tips that would make it easier. Tip #1 - Condition the clay - When the clay comes out of the package it feels tough and I have found that conditioning it can really help. Since it comes in 50 gram packages I usually divide it in half and condition it on two sections. How to condition it? I place the clay between two sheets of plastic (either between a cut plastic bag or between a report cover), then I will roll it flat. Once the clay is flat I paint in some water and fold the edges over then roll again. I repeat this until the clay begins to feel soft. I will condition the clay, periodically as I create when the clay begins to crack. Tip # 2 - Don't use too much OIL. This tip is a little tricky as you need to use something to prevent the clay from sticking but you have to be careful. I still use oil but make sure it does not pool in the texture sheets (to remedy this I will often use a toothbrush to spread the oil into the textures and I have a piece of paper towel by me to dry of any excess). If you end up too much oil to the Art Clay Copper it becomes crumbly. Tip #3 - Make sure you pieces are stuck together well. I make paste by adding water to a bit of clay...let it get sticky...then it is ready to use. If I am attaching two dry pieces, I will dampen both pieces where I want to stick them and add the paste. I will often rub them together to make them stick and bit and hold them firmly and a little longer than I do with silver clay just to make sure they stick. Solution to the sticking problem is laying down a sheet of fiber paper. Another option is fire it in vermiculite. I have a separate batch of vermiculite that I use for my copper clay as you will get firescale bits in it. Other notes: Apparently you can fire Art Clay Copper in carbon (Why would you want to? - to avoid the firescale). How? According to Pam East you put in in the carbon and fire at 1778F for 3.5 hours, remove when the pan cools to 200F. I have not tried this yet. I will be teaching a level one Art Clay Certification at BeadFX March 18, 19 and 20th. This is a chance to really learn tons of tricks, tips and techniques for working with metal clay. I am passionate in teaching many tips and tricks and alternative ways of doing things. Successful completion of the workshop entitles you to a 35% discount on Art Clay Silver and you are trained to teach others metal clay. I have blogged about the course in the past so if you want more information refer back to this post. You can also email me with questions heather@finesilvergirl.com . Register early as I need to register registrants with Art Clay World USA and ideally I need names 2 weeks in advance!!! (some exceptions can be made). 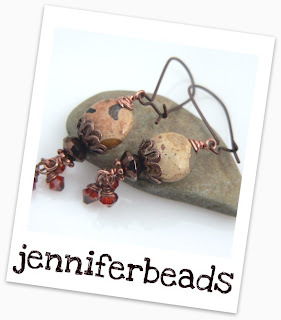 Picture this, it’s your best friends birthday and you’ve made her a fabulous pair of earrings. You’re at her birthday party and it’s time to open the presents! As she looks at the pile she picks your present up. From out of the crowd comes a comment, “oh what do you think that is? More earrings? Another necklace?” and a chorus of guffaws erupts. As you look around you realize that all your friends are decked out in your creations. When you go home you look around your house and realize you can’t find your dining room table because it’s covered in beads. It’s time to sell some of your work. There are 3 ways you can sell your work: retail, wholesale and consignment. Retail means that you sell directly to the public. You are the store. The most common form of retail sales are craft shows. The next is online sales. You can also sell retail through office parties or home parties. This is when a store tells you “we will buy 10 X, 8 Y and 12 Z” and gives you a cheque when you deliver the work. You place work in a store, if it sells they give you a cheque after X days. Most successful business use a mixture of all 3 sales methods. Retail is fast, and the most profitable however it involves a lot of time selling, which isn’t for everyone. While wholesale gives you the most studio time you do have to have a good collection nicely broken into lines and you have to be committed to production work. It is also very difficult to find stores who are willing to buy wholesale as it does involve financial risk for the store. Consignment is a good way to break into stores however you must be vigilant about record keeping. So how do you see your business selling? Are you a people person who loves the public? Can you create a good display for a show? Do you love photography and writing and computer work for a good online store? Can you market your own work? Most importantly if you are considering selling to stores, can you afford to be paid 50% of your pricing and still make a profit? Take a long hard look at your work and think about yourself. What do you want to do? With a new year, how about we make a few little changes to our Inspiration Friday posts? This year, you pick your inspiration reference! There are lots of places to find inspiration. Photo's, magazines, fabric, nature, patterns, textures...Have a really good look at the little things around you, and make something - anything at all. The whole point is to get you out of your comfort zone, and experiment with new beads, materials, found objects, ephemera - anything you can find! We'd love to see what you come up with. Send us a picture of your new creation, along with a pic, or description of your inspiration reference. Send it to contest@beadfx.com with the subject line "Inspiration Friday"
If you have a personal blog, or etsy/artfire/bigcartel type site - send us a link to that as well! It's an interpretation of a Rose. 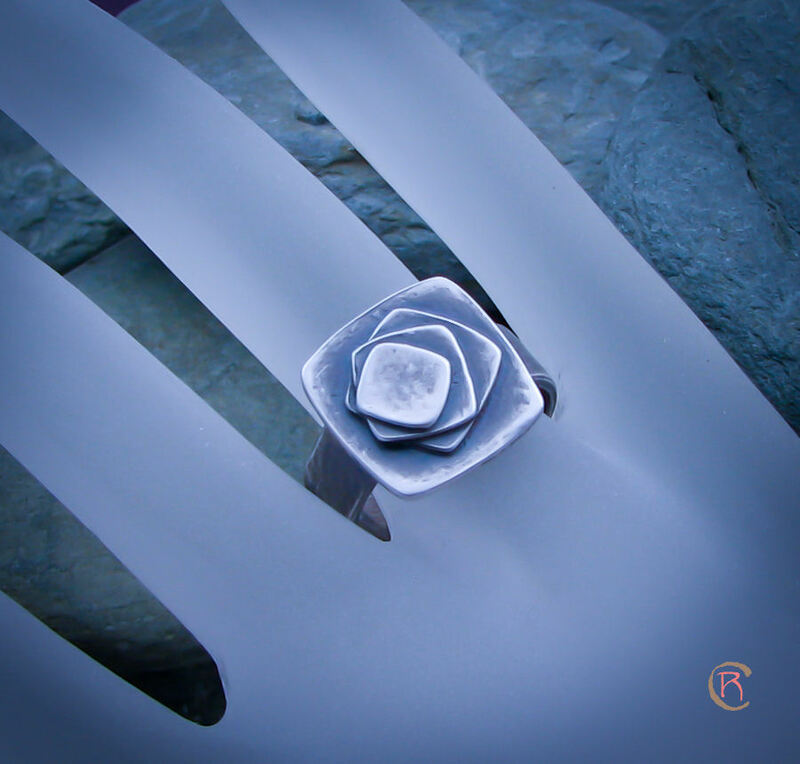 Sort of a contemporary twist on a flower ring. 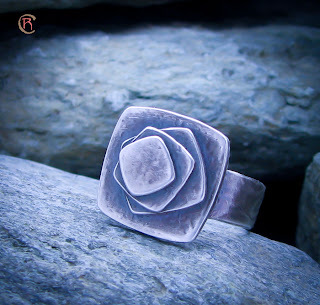 A modern Rose Ring. I submitted it to the RAW2011 Flickr Group where we make 1 ring per week for the challenge. I have something far less pretty for you this week. In fact, I'm not really sure where I'm going with these yet. I am enjoying just futzing around in the studio though - that counts for something right? lol! I'll be a wee bit delayed in posting today - I should be back in the studio later this evening to photograph everything. If you have anything to show off this week - Please send it to info@beadfx.com with the subject line "Inspiration Friday"
You may have seen links for Bead Table Wednesday before. I'm not sure who started it, but there are a bunch of bloggers who post pics of the goodies, and artistic works happening on their bead tables - on the Bead Table Wednesday flickr group every Wednesday. I've been tempted to join, but I know I'll have an impossible time of keeping up with it. However, there is one new group that I don't think I'll have a problem keeping on top of.... It's the Desk Disaster Friday group - started by Diane Hawkey. Be sure to read her blog entry regarding starting this group. Hillarious! In the meantime, have a look at some of the fabulous beads and pendants created by ceramic artists on the BeadsofClay website, and blog. You'll find technique posts, artist interviews - and of course lots of eye candy. There is a lot going on in March by way of classes. Before going on about that, there is 1 spot left in the Moorish Tile Beads class, and 4 spots left in the Gingko Leaf Necklace class. If you've already signed up for any of Diane's classes, you'll be receiving an email from me in about a week with class details and handouts. If you haven't signed up, now is the time. Stephanie Dixon has two new classes on March 5th. Lots of bling as usual! I've had requests from folks looking to be certified as Art Clay Silver instructors. I've been able to work with Heather Bell Denison and we've scheduled one for March 18th - 20th. It's an intensive 3-day course, but it's well worth it. You'll come out with the skills and knowledge needed to teach Art Clay Silver. The Art Clay World USA, Inc. website has a lot of tips and useful information. See the full schedule for the month of March here. Twice a year - "insiders" - like us - get this posh little box from Swarovski with samples of upcoming items in it! Like a box of chocolates - there is a legend on the lid. I imagine that one of these days these little boxes will become collector items. Here is the latest batch of goodies! First up - a new opal (translucent) colour. This is Chrysolite Opal. It is a greener colour than Pacific Opal - although in some lights and with some backgrounds, it can look very similar. The two donuts on beading wire are the older Pacific Opal, the loose beads are Chrysolite Opal - the oval stone shows the colour best. Next - a new "effect" - a surface treatment (like AB). This is Crystal Bronze Shade - which is like a warm version of Crystal Silver Night. This is a close up of Crystal Bronze Shade in a fancy stone. These are Crystal Blends - Amethyst Blend and Topaz Blend. These are shaded colours, a la Air Opal and Fire Opal. I love "ombre" - shaded stuff - so I'm really looking forward to these! New shapes in sew-on stones - the one on the right cries out to be in a bracelet, yes? New shapes in flatbacks and hot fixes. Now that you know how to use these! (Oh, and look for a class that Stephanie Dixon will be teaching on hot fixes!) (This is the Eclipse (2037) and the Rivoli Triangle (2716). And speaking of flatbacks and hot fixes, Swarovski continues to optimize their shapes to improve colour and sparkle. Look for smaller tables (the flat part at the top) and larger facets on the side. This is the Xilion Rose Enhanced cut (2058). New pearl colour - Vintage Gold. A new flat cube bead - called the Stairway Bead - (5624). This looks like a winner for the bracelets - where lots of bead showing without lots of volume is great! And for those of you with Pandora, Troll and similar interchangeable bead systems - the BeCharmed Helix Bead. (5920). Metal core, big hole, and a rolling facet pattern. And, I have to say - this bead is freakin' stunning. Simply awesome. I would go out and get the bracelet just to wear these. And the new heart shape - the Truly in Love Heart (6264). The bead is symmetrical - although the faceting pattern is slightly different from side to side. New rivets - in square - for clothing - or maybe you can adapt them to your steam punk designs? And the addition of metallics to pre-made hot-fix transfers. Yep - exciting stuff coming at ya! Looking forward to it all! OK, so now you’ve all put together your new LINES for your collection and you want to get these into a store. Excellent. First, find a store. Not just any old store, it must be a store where your work will fit in and where you think your work will sell. If you have a store in mind the best thing you can do is to actually visit the establishment anonymously and see if you can picture your work in there. Are you and the store a good fit? If you are making base metal steampunk jewelry perhaps a high end gallery isn’t a good idea. If you’re making gold/diamond/expensive/small delicate work then a local hipster store won’t really work for you. Always do your research first. Check to see how busy the store is. If possible visit the store a couple of weeks after your first visit. Do they have new work? Does it look like they’ve sold a lot? Chat with the store clerk, are they friendly and forthcoming with information (like what sells well)? What price points do they emphasize? Pay special attention to their jewelry lines. What's on the tags and who provides the tags, the jeweler or the store? Do they have too much jewelry already? How would your work stand out among the competition? If you decide that you think you are a good fit the next step is to make an appointment with the BUYER. Every single store has a buyer even if it’s just the owner wearing a different hat. Shop owners are busy people trying to run a shop, if they know you’re coming in then they are ready to deal with you. Do not just wander into a store waving a pair of earrings in the air. The best thing you can do is to present yourself as a legitimate business. You are a professional and so is the buyer. Act professional. Call for an appointment. Show up on time. Have your business card ready. Have your jewelry ready to be seen. Dress well, meaning dress like your brand. Oh, and DO NOT forget to wear your own jewelry (you’d be surprised how many jewelers don’t). Sidebar: You are as much on display as your jewelry is. You are part of your brand. Branding is all about consistency. You must be the same style as your jewelry. If you’re making little tiny expensive diamond studs and hand engraved gold then wearing a heavy metal t-shirt and ripped jeans may not be the most appropriate look. If you’re making industrial chic work, perhaps leave the Armani suit in the closet. Be your brand. When meeting with a buyer, I recommend having an overall sampling of your work in a couple of jewelry presentation displays (simple trays with your work pinned down work well), and the rest of your inventory handy in other jewelry presentation cases / trays / displays. Shoe boxes and baggies in the bottom of your purse do not give the professional air that you are trying to achieve. This way you can start by showing them a good overview of your line, so they won't get impatient to see your necklaces while sitting through tray after tray of earrings. Buyers will usually zero in on a certain line or lines and want to see just work from that series. Have your business cards, price lists, line sheets, order forms, copies of your artist statement or bio, postcards, and any sales material with photos of your jewelry in a folder, briefcase, or pocket of your jewelry display case. It's a nice, professional touch to give the shop owner all your literature in an inexpensive folder as a convenience for their files. Also have some pens and a calculator handy, for filling out your order form. Insiders tip: When filling out an order form (at a store or at a craft show booth) you need a copy of the form for you and a copy for the customer. You can get a 2-part carbonless form (sometimes called an NCR form) printed at Kinkos for about 50c each. My forms are on 8x11 paper, they have my logo and then the information that I need. I print out one then take them to Kinkos and they produce a 2-part carbonless form for me! Simple and easy. And so professional. After your appointment, send a thank you to the buyer for taking the time to meet with you even if they didn’t place an order. It’s the little touches that get you remembered. If they did place an order, go home and do your happy dance and then get down to work. So much for Inspiration Friday this week! I did read a particularly amusing post over on Art Bead Scene - If you work from home/are self employed - I think you'll find it just as amusing! Have a fabulous long weekend for those of you lucky enough to get Monday off! Lark Jewelry is publishing an exciting new jewelry book in our “500” series, and we would like you to submit images for consideration. 500 Rings, to be juried by Bruce Metcalf, is second collection of juried rings in the 500 series. Following the widely popular 1000 Rings (Lark Books, 2004), this encore installment will be a 420-page, full color survey of contemporary rings created after 2000. This international collection will be beautifully presented and widely distributed throughout the world in Spring 2012. We welcome outstanding images of rings made from any materials and in all design styles. Jewelers whose work is selected for inclusion will receive full acknowledgment in the book, a complimentary copy, and discounts on the future purchase of books. Artists retain copyright to their work. Lark accepts high-quality digital images, transparencies, and slides. No entry fee is required. Submissions must be postmarked by March 30, 2011. Thanks, and we look forward to your submission! It's almost Diane Fitzgerald time! Diane Fitzgerald is an author and award winning jewellery designer. 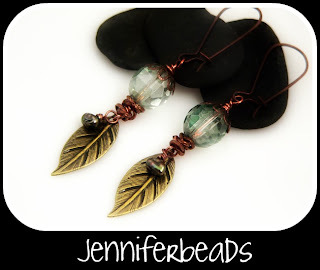 Her work has been featured in various beading magazines including Bead & Button. Courses are filling up. See full course schedule below. Also, Diane will be presenting a lecture on Fads and Trends in Beadwork at the next Toronto Bead Society meeting, March 9th. See their website for more details. Finally, if you are looking for something fun to do this long weekend, consider a beading class at beadFX. On Sat. 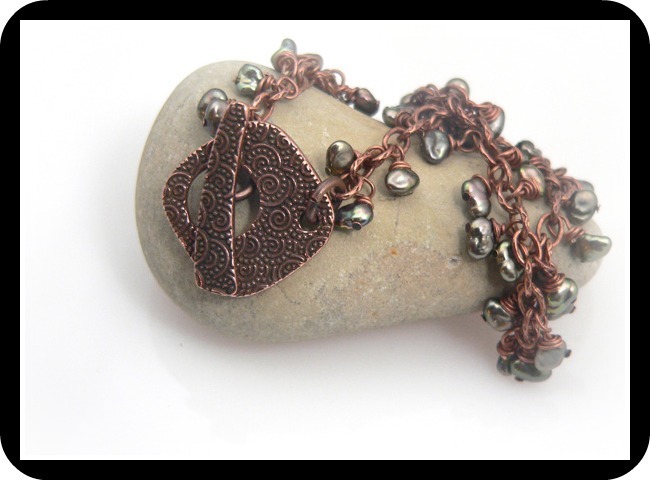 Feb 19, Stephanie Dixon will be teaching Wire Lace Multistrand Crocheted Necklace. You will learn how to make a 3-strand wire lace necklace dotted with Swarovski crystals. Adios Amigas and Happy Family Day! I found these instructions for folding little origami boxes - and I thought - how cool is that? You could make custom boxes for your jewelry, or your beads - or if you do craft shows - to display in. Wish I'd seen this when I still did craft shows! and if you want lids - same idea - just adjust this size a little. Sorry this is short - my back is killing me - typing is agony. I am often at a loss when it comes to organizing. This weekend I have taken on the challenge of organizing my studio and possibly letting go of some of the stuff I have been holding on to (because you never know when you might need it). Reorganizing and getting rid of stuff is always a challenge but I realized that I primarily use the stuff that is in my portable kit that I take when I travel and teach. It took me a while to figure out but I ended up taking this old Art Bin (I bought a long time ago, I remember buying it and thinking this is great and not really putting it to good use until now). What makes it great is the ability to divide up some of my cookie cutters (in the long narrow compartments in the picture) so that they are easily accessible by shape. The other thing I bring with me is a simple little stash of fireable gemstones stored in a weekly pill organizer. It is the best to organize them and affordable as well. I have a larger one that I will use to put in bits of silver wire and findings. There are a few tips for making a portable studio. Share your ideas. It’s another slow sales time of year so we’re back to working ON the business rather than IN the business. That combined with having just written our 2011 business plan (you did write a plan didn’t you?) means that it’s time to tackle how to sell our work for the next few posts. Even if you don’t want to quit your job and make this into your full-time occupation you still have to sell your work. Work costs money to make. Do you know how much you have invested in your craft bench? Do you track your expenses? Wouldn’t it be nice to recoup those costs? So lets sell some work. Before you approach a store or stand in front of the public in a booth there are some vocabulary words you should know so that you can sound like a serious professional. Series or Line – a series or line is a group of work with a common defining element. One-of-a-kind – as the name says, you have made (and will only make) ONE. You will not reproduce this piece every again. Limited edition – this is when you design a piece and make only a certain number of them. When they’re sold out, that’s it. Production – production pieces are pieces that you do on a repeated and unlimited basis. When you stock an online store or a jewelry booth, or approach a store you should present several lines in your collection. A line means you have a coherent body of work not a random bunch of chaotic material. The common defining element can be an idea or a thing, what you are trying to do is show unity. On a table this also means that the work all looks like it belongs together. My most popular series is my “Ocean” series (hey, I am Sailorgirl). Within that series I have a variety of price points and of course necklaces, bracelets, pendant and earrings. Some of it is silver (such as a small starfish pendant) and most of it is glass. There are all sorts of different designs but they all represent Ocean in some way. When put together it is coherent and consistent. Usually when a store buys from you they will look at several lines and then pick one or two that they carry. When you walk into a jewelry store look around carefully. It is well curated not just random pieces. Take a good look at your work, does it look like it was made by the same designer? Are there matching pieces, or sets? Customers may not buy the matching earrings to a necklace but they like to know that they’re available. If you are stocking on online store or your own craft show booth keep in mind the concept of “lines”, does your store look coherent? One of a kind work sells well in a craft show. It is difficult to sell this work online and make money, the time you invest in shooting the images and listing the work will outweigh any profit on the piece. For this reason it is also difficult to sell one of a kind work to stores and make any profit. Unless you can sell your one of a kind work at a very high price it is difficult to make any money on it at all. The time you invest in design and making is usually too much to recoup. Not that I’m saying you shouldn’t make one of a kind work, not at all, you can balance this off by making money on your production work. Production work is the bread and butter of any jewelry business. Production work doesn’t mean that you start making 1000 of every design, it means that you find a design or technique and make it over and over. You can make it in different colours, different materials (copper vs silver, rose quartz vs turquoise), or different sizes. By making a piece repeatedly you become faster reducing your labour costs. Stores are also much more likely to carry work they know that can get again. Limited edition work is a way of combining the elements of one-of-a-kind and production. Because you are making a design several times you will reduce your labour costs and your material costs (always cheaper to buy in bulk) and a customer knows that they aren’t buying a mass produced item. Many times customers love your one of a kind work but they aren’t willing to pay the exorbitant costs. Bottom line, do you look like a professional designer? I don't have too much this week for you as I'm still trying to get my studio cleaned up in between doing a million other things. I do have a few things, but I mainly had fun editing them in picnik. It's a free online (and very easy to use) photo editing site. Upload your pics, edit, crop, and add fancy text and effects. Love it!!! My Inspiration Friday post will be coming up later tonight. If you have anything to show off this week, please send it to info@beadfx.com sometime today. I must make one of these for myself - One of these days! There's lots coming up next week by way of classes. Are you interested in learning how to make glass beads, but you're not quite sure if it's for you? You can take a 4-hour class Sunday Feb 13 11am to 4pm with Amy Waldman-Smith. Of course, this class will barely scratch the surface of the wonderful world of lampworking, but you'll be introduced to basic concepts. Angela Peace is an expert on Chinese Knotting, and on Feb 13 11am to 2pm, she will be teaching the Pan Chang Knot. The Pan Chang Knot is a classic Chinese knot that can be used in combination with beads and other types of knots to make eye-catching jewellery. All levels of experience welcome! Learn how to create your own patterns using peyote stitch Feb 17 6-9pm! This class is for seedbeading enthusiasts looking for new ways to re-work their patterns and create new ones. See details here! 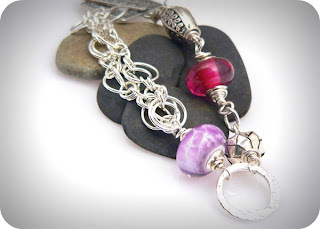 I'm always amazed at the number of designs Rae Huggins can come up with using coiled beads. Here is a new one. You can learn how to make the Beaded Coils and Links necklace Feb 16 6-9pm.